1The EU as a global stakeholder has become embedded in the local context of the Brussels region. As such, it has (together with the other international institutions present in the city) exercised a strong impact on its urban environment, stimulating as well as conditioning its development. It is accepted that the EU offices and other international institutions have had an important impact on the constellation of the city and that the presence of their officials has influenced many branches of the local economy. The presence of the EU and other international institutions has undoubtedly internationalised and globalised Brussels. It has reinforced the city’s potential as an urban attractor, leading not only to the ubiquitous presence of numerous interest groups, but also enhancing the development of the city as one of the most important locations of global NGOs. In relation to the decline of capital functions in the decentralisation of the Belgian federal model, the international vocation of the city has become the core of urban strategies (see the newly proposed International Development Plan). 2At the same time, the presence of international institutions has not been unproblematic. The European quarter, housing the EU institutions, for example, has acquired a negative reputation as an ill-elaborated project of urbanisation (European Union, Belgian Presidency 2001). After several attempts, an integrated local development plan to rebalance dynamics in the quarter has now been accepted. Moreover, it is frequently assumed that the presence of a large number of generally highly paid international officials has contributed to the social and spatial dualisation of the region, for example by their impact on the housing market. 3International institutions have indeed transformed Brussels into a city embedded in global networks, i.e. the networks of global economy and global governance. At the same time, the preponderance of governance institutions and stakeholders involved in the governance process (such as lobbyists) gives the globalisation of Brussels quite a unique character. Brussels is a city which has always drawn its development from its political functions. It combines the large presence of international institutions which characterises cities such as Geneva and New York with that of lobbyists, as in Washington DC. Studying the impact of international institutions located in Brussels on its urban environment should therefore provide a unique opportunity for an in-depth quantitative and qualitative analysis of the dialectics of the global and local characteristics of a post-modern world. As a small world city, Brussels is a good example of glocalisation processes. Impact studies should inform these processes more precisely. 4The impact of these international institutions in Brussels can thus be assumed to be complex and contradictory. Since this impact is both economic and extra-economic, it cannot be understood comprehensively in the narrow framework of a traditional economic cost-benefit analysis (as has been the case until now): the social and environmental impact of these institutions should be integrated into this process. It also implies a close understanding of the dynamics of urban spaces on the one hand, and of the workings of these institutions on the other. It should make use of a methodology which enables the integration of data – besides costs and benefits (economic, social and environmental) – such as the evaluation of the qualitative dimensions of urban space, based on the informed opinions of relevant stakeholders. 5For this purpose, in this paper we propose an argument for a more comprehensive approach to following the internationalisation process of the city. For both financial and political reasons, our proposal has not yet been implemented. The methodology is based on a multi-criteria analysis and multidisciplinary research, which enables the integration of both types of data and the involvement of stakeholders. In what follows, we shall outline the main characteristics of the proposed methodology. We start with an analysis of previous impact studies on the same subject, and then discuss the various new dimensions and methodologies which should be incorporated into the comprehensive approach. 6The impact of international institutions on Brussels is quite a unique case, because no other city combines such a presence of international institutions and private lobbyists. It is therefore difficult for the methodology to follow other case studies exactly. It has to take the uniqueness of Brussels into account and adapt available expertise and research methods to this goal. For this purpose, previous research on the impact of international institutions on Brussels is the obvious starting point (Mens & Ruimte s.d., 1992, 1994; Iris Consulting 1998, 2001; IGEAT 2007). 7Interest in the impact of EU institutions (and more broadly of international institutions) on the Brussels context is not new. Urban activists in Brussels have repeatedly voiced criticism regarding the creation of the European quarter, perceived as an example of bad urban policy. Political stakeholders in Brussels have frequently pointed out what is perceived as the privileged positions of the EU and its officials, and the socially detrimental effects of their presence (in particular a growing social polarisation and pressure on the housing market). Both the Belgian federal and the Brussels regional governments have been aware of these tensions and have been involved in countering them. The previously executed impact studies must be understood in the context of the conflictual integration of the EU in Brussels. They have reflected the fears of the government of the Brussels Capital Region that the costs and benefits of international institutions are unequally divided in territorial terms, with the costs concentrated in Brussels and the benefits concentrated in the periphery outside the borders of the Brussels Capital Region (Mens & Ruimte s.d. ; 1992, 1994). Finally, they have been related to the (fears about the) political impact of any overly positive results as regards the budgetary consequences at EU level. In short, this research is heavily embedded in a political context. 8Impact studies of international institutions in Brussels have their origin in the early 1990s. In 1990 and 1992, the consultancy firm Mens & Ruimte conducted the first of these studies, commissioned by Minister Jos Chabert of the recently created Brussels Capital Region (Mens & Ruimte s.d. ; 1992, 1994). Their research resulted in four large volumes, which analysed the impact and at the same time developed a methodology for the analysis. The study was mainly (but not exclusively) conceived as an economic cost-benefit analysis. Because of the systematic analysis of the methodological problems and the solutions it proposed, this study remains a crucial starting point for further research on the topic. How much wealth is produced by the increasing international function of Brussels? Are the benefits not limited to a particular group of private stakeholders (e.g. real estate and catering)? Are the inhabitants of Brussels not left out in the cold? Does the presence of the EU and international institutions reinforce the social duality of Brussels? To what extent can public authorities obtain financial means from the presence of these institutions which would counter the negative side effects? 10It may be observed that the research focused mainly on questions 1 and 5, i.e. those which can be addressed by a classic economic cost-benefit analysis. The study focused on two issues in particular: determining the total purchasing power of EU officials (and more broadly of all the people working in Brussels due to the presence of the EU), and determining the real estate expenses of the European institutions. The reports provide a limited number of elements for answering the other questions. The volume on the social and economic impact (Mens & Ruimte, 1994) focuses especially on the non-monetary impact of international institutions and the overall social and economic dynamics of the Brussels Region. It points to the contradiction between the fact that the region is, in terms of economic added value, one of the richest in Europe, but much less so if one considers the income of its population. A number of negative social tendencies which occurred during the 1980s are highlighted: high unemployment, impoverishment of the population and growth of economic inequality. The extent to which these tendencies are related to the presence of international institutions is less clear, since they are characteristic of most big cities in Europe (Cities for Cohesion, s.d.). The report only makes a tentative attempt to relate these social tendencies to the presence of these institutions, observing that perhaps the EU has an overestimated but nevertheless real impact on the real estate market, with the effect of driving out the local population (Mens & Ruimte 1994). Although this study observed social tendencies, it did not provide any systematic methodology to relate these tendencies to the presence of international institutions, or to measure the social and environmental impact of these institutions. 11The limits of this study are a consequence of the methodology of a cost-benefit analysis, the lack of basic data, the absence of previous research which would have provided the necessary basis for post hoc analysis, and the impossibility to obtain data with the relatively limited means made available for the research. The study was also confronted with the artificial delimitation of the research entity: taking the institutional border of the Brussels Capital Region as a given resulted in numerous methodological problems for the study. It did pay attention to the issue as much as possible, observing how these borders maintain a dynamics whereby Brussels produces wealth which is consumed outside the region and generates tax income which the region does not benefit from. The focus on this issue is one of the aspects which places this study outside the framework of a classic cost-benefit analysis. 13This extensive impact study was later repeated, albeit on a smaller scale, by other studies conducted by Iris Consulting for the Brussels Capital Region (Iris Consulting, 1998; 2001). These studies reflect an awareness of the problems encountered by the first study and limit themselves almost completely to a strict cost-benefit analysis. For this purpose, they use the typologies proposed by the Mens & Ruimte reports, although they extend their scope beyond the EU to include all the international organisations with headquarters in Brussels, and thus also take into account organisations such as NATO and Eurocontrol. 14These later studies do not attempt to develop the analyses proposed in the first study. 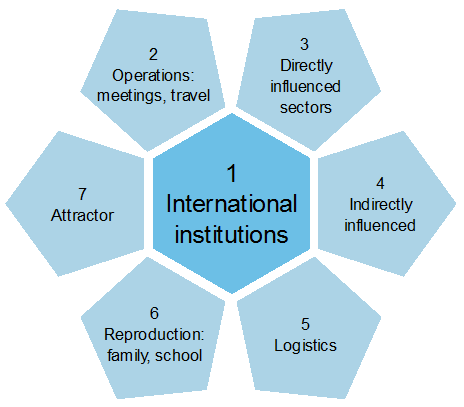 For example, the first study attempted to measure the streams of visitors generated by the EU and other international institutions, but the later studies limited themselves to measuring business venues and visitors to international conferences, and did not propose further analysis of the social impact of international institutions. These new studies do provide social data on Brussels, but as in the previous studies, these data are not related to the presence of international institutions: they only make generic references to possible problems generated by these institutions. These reports are also marked by the intention to counter Euroscepticism and negative perceptions in public opinion of the presence of international institutions and the EU in particular. They cannot be read without considering the context of the debate in Brussels on its international function. They therefore mainly concentrate on measuring the wealth generated by international institutions present in Brussels, e.g. the employment generated by the institutions and the purchasing power of their officials. They thus focus on the benefits of these institutions for Brussels, leaving aside most of the discussion on the costs. 15The latest impact study was carried out in 2007 by ULB-IGEAT under the direction of Christian Vandermotten. It was the first study conducted after the enlargement of the Union with ten new member states. The focus was on the impacts as regards the economy and employment. Four areas in the labour market were examined: direct employment by international institutions; employment by related organisms such as regional representations, accredited journalists, lobbyists, European schools, etc. ; service and logistics for EU activities; and finally, sectors partially related to EU activities. Direct employment represents 4.5% of the Brussels labour market, increased to 30% with 27 000 EU staff and 5 000 from other international institutions. Official institutions related to the EU employ another 12 000 people. The presence of these activities generates another 28 000 jobs directly and another 28 000 jobs indirectly (mainly in tourism and catering). This amounts to 92 000 jobs, or 12.7% of the employment in the region. Most of these jobs (53 000) are held by Belgian nationals. The economic impact is estimated to represent 12.9% of the GDP. Two sectors have been examined in particular. Commerce benefits from the great spending capacity of most of these employees and has adapted to the habits and time structure of these customers in different places in the city. The presence of international institutions accounts for 30% of leisure overnight stays and for 70% of business tourism. More than half (i.e. 2.6 million nights) is due to this international sector, which accounts for 63% of the spending. 16As regards residence, 60% of the international staff live in Brussels as opposed to 46% of those employed in Brussels. The overall impact is calculated to be 12.7% of the region’s employment and 13% of its added value. 17The most recent summarised overview of the EU presence in Brussels is a document produced by the Brussels-Europe Liaison Office3 which discusses the presence of staff in Brussels related to the international functions of the city. Almost 170 000 of the foreigners in the city have an EU25 nationality. Between 38 000 and 41 000 work in or for the European institutions, and another 20 000 are employed in related activities. 18Beyond these general impact studies, more focused research has documented local impacts such as on the Tour & Taxis site or the European quarter. On the other hand, a broader discussion exists regarding the European mission of the city, most recently summarised in the doctoral research by Reinoud Magosse (Branding Brussels as the Capital of Europe). Our comments are limited explicitly to the encompassing impact studies. 19The Mens & Ruimte studies, as well as the later ones by Iris Consulting and IGEAT, have attempted to measure the impact of EU institutions on the Brussels Capital Region by means of a cost-benefit analysis. Their studies provide several crucial contributions for further research. These include the typology according to which these institutions and the dependent sectors are categorised, methods for counting the staff of these institutions and their expenses and for the analysis of the directly influenced sector, and, of course, a set of data with which any future research on the issue will have to be compared. Although these studies provide interesting information and elements of a methodology for analysing the impact of international institutions, they do not examine the entire situation, and their approach leads to a number of important methodological problems. The first one concerns their characterisation of the urban space. Initially, these studies viewed Brussels according to administrative criteria. Because they were conducted for the Brussels Capital Region, they essentially provide data for the region itself, limited to the 19 municipalities, with only a limited number of assumptions on further effects outside the borders of the Brussels Capital Region. At the same time, previous studies interpreted the Brussels region as a rather abstract economic space within which the impact is understood as an economic surplus (see among others contributions 3 and 11 in Brussels Studies). 20A second methodological problem with these studies concerns their analysis of international institutions, as they concentrate on the material presence of these institutions. They do not take full account of the more qualitative impact of these institutions (e.g. the visitors they attract) and underestimate how this impact may change due to the dynamics generated by their evolution, especially in the case of the EU. 21Both of these limits are related to the methodology used in these studies. The obligation imposed by the cost-benefit analysis to monetarise all costs and benefits renders it impossible to take into account the qualitative aspects of the impact of international institutions: several goals of city planning cannot be expressed in monetary terms. The use of an economic cost-benefit analysis therefore implied the neglect of various important qualitative aspects such as the impact on culture, the image of the city, etc. Moreover, the result is a unilateral cost-benefit ratio, whereby the losses of some stakeholders are simply compensated by the gains of others. It is more important to map these losses and gains instead of just summing them up. This quantitative approach does not allow a view of the urban context in its totality, excludes its qualitative dimensions, and above all does not include the visions and informed opinions of the numerous stakeholders involved in the evaluation of the impact. It might well be that the uneven distribution of the international impacts is one of the driving forces of the ongoing dualisation process. In contrast with the administrative and economic view of previous impact studies, it would have to be based on a more refined and qualitative understanding of the distribution of costs and benefits in the urban space. It would have to propose a more dynamic understanding of international institutions present in this space. It would have to deploy a methodology which, in addition to quantitative elements, would include the qualitative dimension of the impact of international institutions, thus enabling the participation of the stakeholders involved in the issue. 23In the next sections, we first describe meaningful urban dimensions (section 3), followed by our proposal for a new comprehensive approach (section 4). 24In contrast with the administrative and generally abstract economic space of previous studies, our proposal suggests an understanding of the space in qualitative terms, whereby the administrative and economic spaces are considered part of the urban system. This system is characterised by the density and diversity of people and activities in a limited space, leading to a multiplicity of desired and undesired interactions and interrelations. To propose adequate policy interventions, it is crucial to have a good perspective on this multiplicator. We therefore propose that this research should pay particular attention to the spatial impact and the presence of local clusters, whilst weighing the impact against existing criteria of good urban policy. 25Firstly, redefining the Brussels urban system implies a questioning of the limits of administrative borders imposed by previous research (although these limits and the borders of municipalities within and outside the region obviously remain an important feature in understanding the impact, since they determine regional and local tax incomes, for example). Secondly, it implies that attention should be paid to spatial diversity within the urban space, replacing the abstract unity of the economic space into the concrete social and cultural diversity of the territory. The formulation of criteria of good urban policy and, more generally, the introduction of a qualitative dimension in the evaluation of the impact, implies the involvement of stakeholders. Policymakers, including international institutions, citizens from the Brussels region and its periphery, local civil society and, in particular, the vast and very active range of organisations and networks involved in urban issues, should therefore be included in this research. 26The definition of such criteria of good urban policy can rely on the already consolidated tradition of policy and academic reflection on this issue. Such criteria were formulated by the “Cities for Cohesion” network which the Brussels Capital Region belongs to (Cities for Cohesion, s.d.). On the basis of a SWOT analysis of large urban regions, this network proposes recommendations such as the development of an innovative knowledge economy, an employment policy against social exclusion, improvement of the environment and urban renewal. 27The Brussels Regional Development Plan sets out twelve clear priorities: residential attractiveness, economic dynamisation, a balanced housing policy, sustainable urban renewal, better planning, the development of urban attraction poles, educational and social integration, a better mobility policy, a sustainable environmental policy, internationalisation and interculturalisation, a security policy, and a research and innovation policy (Brussels Hoofdstedelijk Gewest 2002). 28The White Paper entitled “The Century of the City. City Republics and Grid Cities” (Boudry, Cabus, Corijn et al. 2003, 2005) presents similar goals for urban policies in Flanders. In this volume, the traditional policy domains are clustered and transposed into well-organised development criteria. The basic analysis is based on six related perspectives: the built city, the public city, the entrepreneurial city, the city of solidarity, the multicultural city and the participating city. These six registers already cluster traditional sectors of urban dynamics such as town planning, the public functions of the city, its social and economic dynamics, society building, urban culture and, finally, the political and democratic design of the city. In a further stage of the analysis, these six levels are confronted with the four criteria of good urban governance which are developed: sustainable development, density, diversity and democracy ‑ the four Ds of good urban governance. 29By intersecting the six city perspectives with the four Ds of good urban governance, six policy axes are obtained, each of which can be determining factors for good governance. These axes may also be deployed as dimensions, which may be used to evaluate the impact of international institutions in Brussels. Glocal strategy: positioning urban dynamics on the right scales and in the right networks in the context of globalisation and the new location of cities in a competitive space. It is to be expected that our research will reveal positive impacts on the position of Brussels as a (small) metropolis and that these impacts are present from the neighbourhood level up to global networking. Coordination and integration in town and country planning: the borders of an urban system do not always coincide with the existing administrative organisation. Each social activity has its own scale, its own borders and its own interconnections. Good governance has to manage the presence of these different spatial levels and must strive to interconnect them. Here, we work with the notion of “grid city” and attempt to follow up on the impact at an appropriate level (and thus not limit ourselves to only one level, i.e. the region’s territory). These interconnections thus concern both the relationship between the city and its surroundings, as well as the networked relationship between the city and rest of the world. Qualitative density: a city is naturally characterised by its density, but this density needs to be evaluated and managed. The statements that the city is full and that sustainability implies a higher density need to be qualified. There is a need for an evaluation of density according to qualitative criteria, place and function (health, interculturality, housing quality, environment, etc.). It is this density which enables Brussels to be a very adequate city for its international function. Innovative and creative strength: cultural, artistic, social and political renewal are characteristic of an urban environment. It is the proximity of the various functions and activities which enables the interactions and process of mutual influence which may lead to innovation and invention. This is perhaps the central criterion which distinguishes cities and gives Brussels an important advantage as the only “real” city in Belgium. This creative potential should be recognised and integrated into a vision of the future of the city. It is precisely the international position of the city, at the crossroads of two important cultural areas in a hub of a multiplicity of international interrelations, which may enhance the development of important artistic and scientific creativity. Identity on the basis of diversity: cities are characterised by the presence and interactions of many people of different origins. They have little or no shared past but a stake in a common future. This may be the source for intercultural interaction, on condition that diversity policies take into account the fragmentation, segmentation and spatial inequality in the city. The presence of international activities influences both aspects. City policy based on solidarity: without a correction oriented towards social justice and solidarity, urban dynamics may also lead to dualisation and inequality of opportunities. The impact of international institutions needs to be measured in this area of social integration. 30In the White Paper, these six dimensions are further elaborated into 19 concrete policy fields which produce evaluation criteria to measure these impacts. The “glocal” dimension is tested by examining the degree of openness, the urban alliances and the economic networks. The spatial cohesion is measured by means of the cooperation between the city and its periphery, the various functioning urban scales, and the infrastructural connections. Density is related to the multiple use of public spaces with mixed habitation and the quality and viability of the environment. Innovation and creativity can be measured by the output of artistic productivity or the presence of varied leisure activities. Diversity may be translated into variables such as the public/societal support for art and culture or the existence of cultural divergences and oppositions. Structures of solidarity can take shape in the form of new types of urban cooperation, in the existence of development coalitions, in the new types of societal integration, in the processes of social learning and in the tax system. We favour the development of an analytical model whereby impact is also measured in a relational and relative manner. The international public institutions (the A‑sector) have a central place: firstly the EU as well as NATO, Eurocontrol and other organisations with their headquarters in Brussels. A first functional category includes all activities directly related to the operations of these institutions: international meetings, contacts, etc. This category acknowledges the international presence as a space of flows, which includes the impact of temporary presence in Brussels and the structure of the space of flows in Brussels. Another category includes the sectors directly influenced by the EU and other international organisations. They operate independently, but their activities are determined by international institutions located in Brussels. This category corresponds to the B1‑sector of the previous studies and includes the international media and the diplomatic representations at international institutions. It refers to the service economy which is very important for the city as a whole. The presence in Brussels of the category of indirectly influenced sectors is strongly related to the presence of these international institutions, without being completely dependent on them. This category corresponds to the B2‑sector of the previous studies and includes the following groups: international organisations (NGOs, etc. ), financial institutions with a foreign majority, financial institutions of foreign law, financial representations, law firms, consultancy firms and professional congress organisers. The next categories are involved in the reproduction of the institutions’ operations. One functional category is responsible for all the logistical activities of the institutions themselves. It includes catering services as well as supply services, etc. Another category concerns the reproduction of the institutions’ staff and their families: housing accommodation, education, leisure, etc. Finally, there is the category of activities resulting from the presence of international institutions as urban attractors. This concerns activities not included in the previous categories but resulting from the context created by international institutions, such as tourism and educational and cultural activities. 32This model enables a mapping of the layered and mediated impact of international activities in Brussels. 33A more proactive study of the sectors influenced by international institutions may also yield more extended results. Prospects on their future growth may be elaborated by taking into account neo-functionalist theories on interest groups which draw attention to the spillover effect resulting from the presence of such groups. Research on these sectors enables not only an analysis of this spillover function of the representation of interest groups, but it also reveals how they may act as urban attractors drawing visitors to Brussels, as is the case for representations of sub-national authorities (Huysseune & Jans 2005a, 2005b; Jans & Huyseune, 2008; Magosse 2007). The inclusion of a more comprehensive and theoretically sustained understanding of the working of international institutions and in particular the EU, would thus enhance an understanding of their present and future impact on the Brussels urban space. 34For the reasons analysed above, the previous studies were all centred on an economic cost-benefit analysis. Such an approach is open for two criticisms. The first one concerns its essentially economic scope, as social, spatial and environmental issues are left out of the analysis (in the case of the studies analysed above, these issues are discussed but are not related to the cost-benefit analysis). However, adding a social and environmental impact analysis to the economic one would in itself not be a sufficient alternative. In their mainstream version, these two methods also tend to translate impacts in quantitative and monetary terms. Our intention, on the contrary, is to combine a quantitative and a qualitative analysis, adding criteria of urban governance to hard data, and involving stakeholders in the proposal and development of such criteria. The most appropriate approach enabling the integration of this qualitative dimension to evaluate the presence of international institutions in Brussels would consist of a multi-criteria analysis. The methodology accommodates the manifold dimensions and the multidisciplinary aspects required by studies of ecological and economic issues (Van den Bergh, 2000). By integrating the social, spatial, economic and ecological dimensions into one analysis, a bridge may be built between a utilitarian neoclassical approach and a more interdisciplinary approach (e.g. Meeus, Macharis, & Dooms 2004; Macharis 2000, 2004; Macharis & Boel 2004; Macharis, Verbeke & De Brucker, 2004; Verbeke, Macharis, Dooms & S’Jegers 2004). 35Multi-criteria analysis also responds to the need for a more participatory approach to impact analysis (Van Ham and van Wee, 2003). It allows the involvement of stakeholders, i.e. “any individual or group of individuals who can influence or are influenced by the achievement of the organisation’s objectives” (Freeman 1984). Banville et al. (1998) also highlight how multi-criteria analysis is a highly appropriate instrument to help the many stakeholders in their decisions on economic, social and environmental goals. The method renders the trade-offs between the various goals of the parties involved more transparent. With a multi-criteria analysis, the different options or situations may be evaluated according to various criteria. These evaluations may be monetary, a value or even a score on a scale. This allows the qualitative criteria to be included in the analysis. The analysis proposes an overview of the various strong and weak points of an option or situation and is therefore highly appropriate as an instrument to propose policy options which rectify these weak points. 36The figure above shows the consecutive steps of such a methodology. These steps correspond to the steps required by a multi-criteria analysis. Firstly, the possible alternatives and scenarios are identified and then the main criteria are determined. 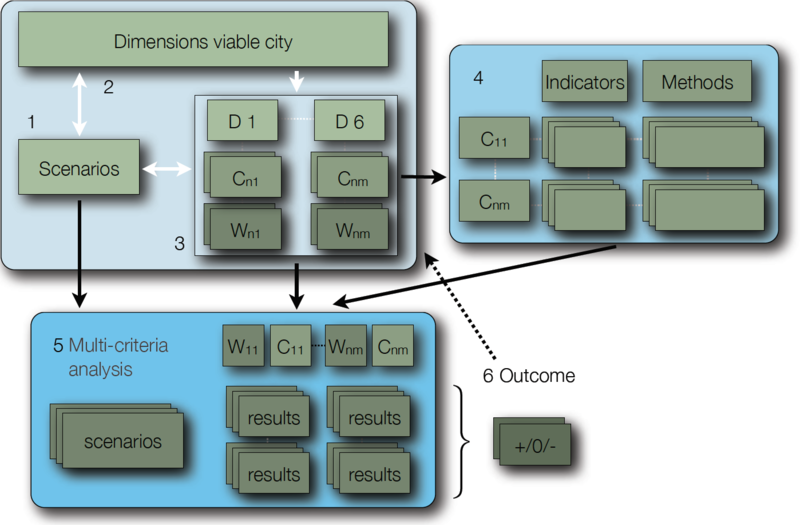 In this project, the scenarios will be tested on the dimensions of a viable city (see section 3). For each dimension (D1…m met m = 6), various criteria can be distinguished (Cnm). The relative importance of these criteria and the proposed priorities also has to be determined (Wnm). In step four, these criteria are further operationalised. Possible indicators and the methods to measure them such as questionnaires, in-depth interviews or panels, need to be decided at this stage. Step five consists of the final multi-criteria analysis: the different scenarios are evaluated according to the various dimensions. The result (step 6) is a classification of the different scenarios for the various dimensions and an overview of the positive and negative aspects of the scenarios. This may lead to the formulation of scenarios through which the proposed policy goals may be reached more effectively. 37Various methods are available for the multi-criteria analysis, such as the Promethee method, developed by Brans (1982, 1996) and extended by Macharis, Brans and Marechal (1998) or the AHP-method (Analytical Hierarchy Process) developed by Saaty (Saaty, 1982, 1988). These methods are easy to apply thanks to the existence of accompanying Decision Lab and Expert Choice software packages. The method allows the strong and weak points as well as the costs and benefits to come out clearly. For each scenario, it gives a clear picture of the possible policy problems and the possibilities for improvement. This may in turn lead to a further iterative process whereby possible new scenarios with additional policy options which rectify these weak points are developed. The multi-criteria analysis thus proposes a summary of the results of the different scenarios for the various dimensions of a viable city. 38The methodology we propose resumes the economic cost-benefit analysis as conducted previously, extends the analysis to include the social and environmental impact, and integrates the qualitative dimensions of an urban environment in the evaluation through the multi-criteria analysis. These dimensions include culture, impact on the urban space and on social cohesion and the city as an urban attractor. This multi-criteria analysis should provide insight into the positive and negative aspects of the different scenarios whereby the extent of internationalisation of Brussels will be varied. Such a model of analysis has a number of important advantages compared with a traditional economic cost-benefit analysis. It is based on a more refined and more correct conceptualisation of the urban space. By integrating the qualitative variables, it provides a broader picture of the impact of international institutions. These qualitative and global dimensions of the research allow the model to be better suited to city projects which integrate the different facets of urban development. The results of such a study can also be translated more effectively into policy options. 39The international vocation of Brussels is a central element in its urban dynamics. The assessment of the impacts of the presence of international agents should be an ongoing process. It would be a good idea to design an observatory based on interuniversity and interdisciplinary collaboration with a longitudinal approach. BOUDRY, L., P. CABUS, E. CORIJN, F. DE RYNCK, C. KESTELOOT & A. LOECKX (2005), The Century of the City. City Republics and Grid Cities. White Paper, Project Stedenbeleid, Vlaamse Gemeenschap, Brussels. Cities for Cohesion, The Ten Key Principles. http//www.citiesforcohesion.org (consulted on: 8 October 2008). CORIJN, E. (2003), “Apprendre à vivre en ville”, in Recherches sociologiques, Vol. XXXIV, No. 2, Louvain-la-Neuve, UCL 103‑107. CORIJN, E. (2006), “Building the capital of Europe as a heterotopia”, in Heim, C. (ed), Bruxelles l’Europeenne, capitale de qui ? ville de qui ?, Les Cahiers de la Cambre-Architecture No. 5, Bruxelles, La lettre Volée pp. 46‑60. GROTH, J. & E. CORIJN (2005), Reclaiming Urbanity Indeterminate spaces, informal actors and urban agenda setting. A case study in Helsinki, Brussels and Berlin, in Urban Studies, Vol. 42, No. 3, Routledge, London pp. 511‑534. HUYSSEUNE, M. & T. JANS (2005a), “De praktijk van regionale vertegenwoordigingen te Brussel”, Res Publica, Vol. 45, No. 1, pp. 80‑101. JANS, T. & M. HUYSSEUNE (2008), “Brussels as the capital of a Europe of the regions? Regional offices as European policy actors”, Brussels Studies, No. 16, 25 february. http://brussels.revues.org (consulted on: 8 October 2008). MENS & RUIMTE (s.d. ), Brussel, de internationale uitdaging. De directe sociaal-economische impact van de internationale instellingen te Brussel, Brussels, Studiegroep mens en ruimte vzw. MENS & RUIMTE (1992), De indirecte sociaal-economische impact van de Europese instellingen te Brussel. Boekdelen 1 en 2, Brussels, Studiegroep mens en ruimte vzw. MENS & RUIMTE (1994), De sociaal-economische impact van de Europese en internationale instellingen te Brussel. Eindrapport, Brussels, Studiegroep mens en ruimte vzw. 1 It should be observed that the research of Mens & Ruimte was centred on the EU. As a consequence, a number of international institutions, which, according to our perspective but also in the later research conducted by Iris Consulting belong in category A, were placed in the B2‑sector. 2 The reports of Mens & Ruimte also included extended methodological comments on how to measure this direct and indirect impact. Eric Corijn is cultural philosopher, researcher in social sciences and professor of cultural geography at the Flemish University of Brussels (Vrije universiteit Brussel or VUB). He is also director of the research group COSMOPOLIS, City, Culture & Society. Moreover, he is coordinator of the UAB Brussels City Platform (university association of Brussels - Brussels urban platform) and co-director of the international masters programs POLIS and “4Cities”. He is deputy-director of the Brussels Regional Development Commission and member of Flanders’ urban renovation jury. Theo Jans is professor of political science at VUB and senior fellow at the Institute of European Studies (Brussels). He is (together with Kris Deschouwer) the editor of Politics Beyond the State. Actors and Policies in Complex Institutional Settings. Brussels, VUBPress, 2007. Michel Huysseune, Ph.D., is professor of Political Science at Vesalius College (Brussels) and senior researcher at the Centre for Political Science at Vrije Universiteit Brussel (Belgium). His fields of interest include the construction of political ideologies and nationalism in particular, and the interconnections between regionalism, nationalism, and the construction of the European Union. He is the author of Modernity and Secession. The Social Sciences and the Political Discourse of the Lega Nord in Italy, Oxford, Berghahn, 2006.